MultiEnergy-Solutions has pioneered innovative low cost technologies for recycling water, and in particular grey water for apartment blocks, hotels, and sports centres. The mass adoption of our technology will lead to millions of tonnes of water being recovering at a cost of less than $/€ 0.5 per tonne. The technology is non-biological, reliable, as well as being easy to install and maintain. The company is now selling a full solution for commercial applications as well as a range for domestic use. Any water that has been used except for toilets or cooking is called grey water. Dish, shower, sink, and laundry water comprise 50-70% of residential "waste" water. This may be reused for flushing, washing, or irrigation and gardens. Water engineers like to define waste water as either black or grey. Black requires sophisticated treatments before it can be released into the sewage system. By contrast, grey water has lower levels of impurities generally measured by Biological Oxygen Demand � BOD and Suspended Solids � SS. The size of the grey water market is potentially enormous as 50-70% of all domestic, and hotel water is grey and can be recycled for washing, toilet flushing, or gardening purposes. Instead of paying $8-12 per 1000 gallons for sweet water, use recycled grey at a fraction of the price. Why bother with desalination? Lets take a large apartment block with 30 apartments. Average daily use is 200 litres per person. So average yearly needs are roughly � 30 apartments x 4 people per apt. x 365 days x 180 litres = 7884 tonnes of water of which 50% is grey and can be recycled. A tonne of water costs €4 in many parts of Germany so the water bill is €32,000 per annum and the water savings will be €16,000. ELLA The Ella module is , we believe, the most cost effective technology available today allowing water production without government subsidy in many countries around the world. 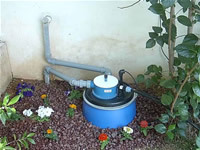 Simple version which has double filter collecting fine and coarse particles. A version including a proprietary clay matrix which absorbs the detergents. 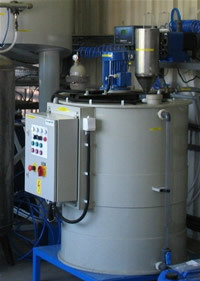 A model which includes a small ozonator disinfesting the output water.